If, like me, you have a PC in your living room that you use as a media center and occasionally for playing local multiplayer games, you’ll probably find that using a keyboard and mouse combination in this kind of setup can be a bit of a headache. When it comes to gaming on the couch, many people just use the same peripherals they have at their desk, which means wires trailing across the floor and the possibility that they won't be long enough. Even going wireless requires you to rest the mouse on a flat surface next to you. I use an all-in-one solution that has a laptop-style trackpad, which isn’t great at the best of times and useless for gaming. 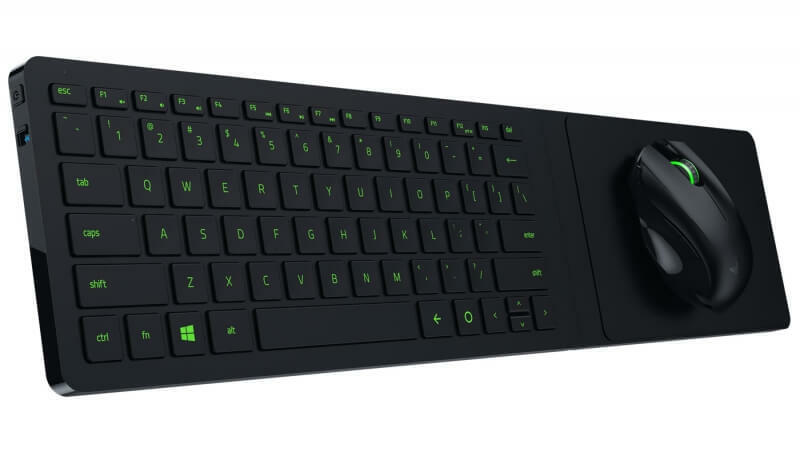 But now a solution may be at hand in the form of the Razer Turret, a device that consists of a wireless keyboard, integrated mouse surface, and gaming mouse, meaning you’ll soon be able to play mouse-essential games like Starcraft 2 from the comfort of your couch. "The Razer Turret brings the immense world of PC gaming to a previously impossible frontier—the living room—where only consoles have traditionally roamed until now," says Razer Co-Founder and CEO Min-Liang Tan. "Finally, we have a perfect solution for gamers to enjoy the unrivaled precision of a mouse and keyboard combination from the comfort of the couch with the durability and reliability that PC gamers demand." The turret doesn’t skimp on high-quality components like many other all-in-one solutions. The keyboard part of the “lapboard,” as Razor calls it, has lovely chiclet keys, anti-ghosting capabilities for up to 10 simultaneous keypresses, some dedicated Android buttons, and a battery life of around four months. The mouse, meanwhile, has a 3500 DPI sensor and is good for 40 hours of continuous use. The turret comes bundled with a wireless 2.4 GHz adaptor for hooking it up to your PC, and the lapboard features built-in Bluetooth LE for connecting to a console. Moreover, the mouse surface is slightly magnetic, meaning it stops the peripheral from easily falling off. There's even a hinge that allows the surface to be folded away when not in use. The only issues people may have with the Turret are that it's not much good for southpaws, and the fact that Razor has increased the price from the $129.99 it announced at CES 2015 to $159.99.